The daily musings of an American in Paris. 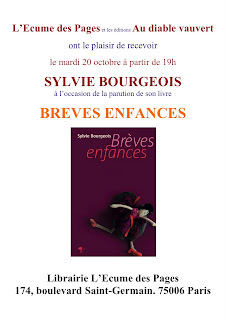 Next Tuesday, be sure to head to famous Parisian bookstore (right next to Café de Flore) L'Ecume de Pages for a book-signing with writer Sylvie Bourgeois. Her new book BREVES ENFANCES brings together 34 stories from children who, through their own words, paint a moving portrait of their families. The stories will make you laugh and cry - sometimes both at the same time. Meet the author - and her husband Philippe Harel for those of you who are fans of the actor-director and his films such as "Les Randonneurs," "French Summer" or "Tu vas Rire, mais je te quitte" which I blogged about when I first arrived in France five years ago, ah la nostalgie ! 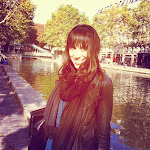 (http://lafleurdeparis.blogspot.com/2006/02/filmz.html). See you all on Thursday !! thx for posting this !